The “Phantom Rose” was built as a multi-purpose vessel offering the capabilities of both open water and river use. 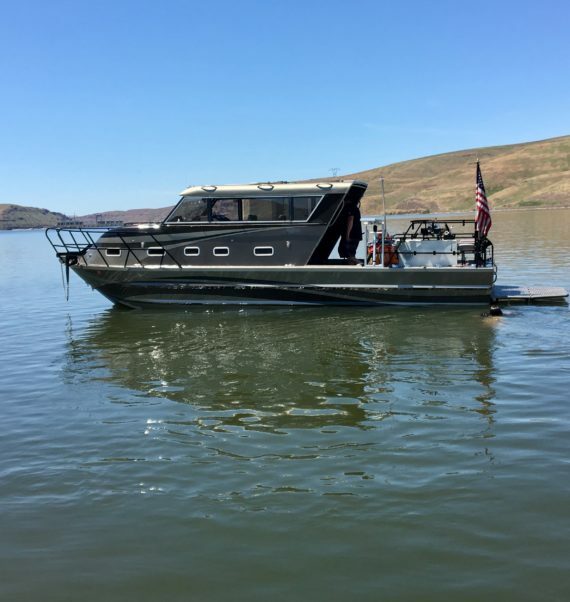 The boat and it’s amenities are designed for living on board whether on the road trailering or on the water. The trailer is wired so that when it is hooked up to a tow vehicle all electrical is being charged from the tow vehicle, once parked there is a gasoline genset mounted on to the trailer itself for use during overnight stays on the road and has a diesel genset available for on the water use. The spacious forward bunk area makes into a full bed or can be used for individual beds. 2 helm stations, one forward in the cabin space and one aft in the open deck space allow for ease of docking. Twin Cummins diesel engines with Hamilton 273 jet units allow for efficient operation and shallow running capabilities.